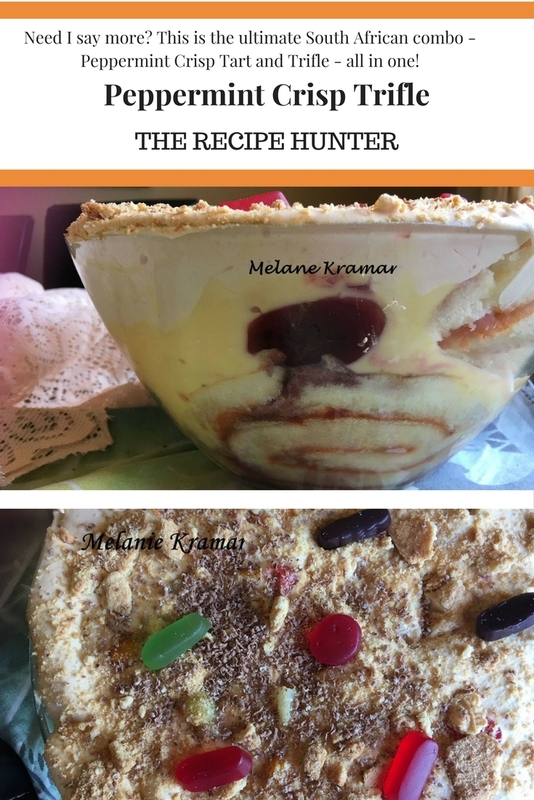 Most people made trifle over the festive season or peppermint crisp tart. I decided to combine them both last week and made Peppermint Crisp Trifle. A visitor who had come to collect my guest said she’s not fond of trifle but that it was awesome and had 2 bowls, as did we! Enjoy. Prepare the two jellies in separate bowls and allow to set in the fridge. When set, place whipping cream in the freezer while prepping. Slice Swiss roll and line bottom and sides of a glass bowl. Add half the fruit cocktail. Add half of each of the jellies. Beat the cream till thick, add the caramel treat and most of the chocolate and beat till combed. Pour over the jellies. At this point, you have Carte Blanche to decorate as you desire with peach slices, berries, cherries etc. Mr Fox will love this, his two favourite desserts.